Last edited by Splitwirez on Thu May 12, 2016 8:08 am, edited 3 times in total. The left main background is very nice to look at. Shows some of glass color. Lots going on. Like an XP bliss hill, or planet of some kind. Or layers of fog on the peat moors in Ireland. Keeps changing to something different, with color. 99 % are rounded corners, and there are even serif curlicues. Search box corners look good. or program that can make a smoother gradient. Then it won't look pixel chunkified, as it will be big and smooth already. The outside submenu button not drawing properly. Needs fixing. Darn. I'll look into that as well ._. You know how some people have an outy belly button, and others have an inny? Don't know if I'm just tired, for the main button looks like it's an innie to me. Not that I have anthing against innies. or just one of either the rgb channel layers, or the alpha channel layer only? Guess it can work both ways. The way you have it, like a chisseled default separator on other skins, for a recessed look. Or opposite, to turn the recessed area into a shine line? It's starting to look ok the way it is. Looks like you fixed the white text on the white background, by changing the menu to dark. Yeah, not really a fix, but atleast you can read it now ._. Looking at the text for search, the tutorial says search area and jumplist get the text color from main text color. Looks like you can make a "list_text" to override the main text, could be any color you want. Just don't know if the jumplist text/search area text can be opposite colors? Something I'll have to play with to see if possible for other skins. Forgot about the shutdown button. Is it supposed to show, or is it invisible on purpose? One with big rounded corners would fall into place? TBH, with this skin, I was aiming to create something of sufficient quality that it wouldn't feel out of place among the skins included in Classic Shell by default. Can someone give me a shout when I'm there? But in all seriousness...does that actually happen? Do usermade skins ever end up being included in future releases of Classic Shell if they're good enough? And if so...what are the criteria? Wow, big difference with color turned on and off. I don't understand what the line means at the shutdown button. Is it part of the button, or overall design? It would be a nice thought to have a modded skin included in CSM set. I'm guessing here, as I used to work in QC. it would need to pass very high standards. It has to be able to work in all types of systems, and configurations, without failure, again and again. Would probably need to pass visibility standards for handicapped people too. Copyright issues can arise as well. Who knows. I'll lick a bug if it happens. Any way, if you are still interested in making the programs background transparent in Win 7 style. or you cold make it different on purpose. Making programs area transparent does not blend the main menu bitmap with alpha and desktop. Will be a rectangle with same alpha value all over. I don't know if a real bitmap can be used or not. The other thing about if it's possible to have text and selector buttons different on jump and search results area. I could not find a way. I'll lick a bug if it happens. Oh...I thought that had to be RGB. Didn't know ARGB was supported ._. Also I just realized that I'm going to need to add an option to invert the white text colours to black, for use on a pale glass colour ._. I don't eat bugs anymore with bets. Was taught in art, that curves are female, sharp corners male. on your original: I don't remember if there was screenshot? I was thinking about changing just the text. I don't think it is possible for every combination. About the rounded cornered button. Just the shutdown button with big round corners. The option for the other buttons nice. The original are ok when small. On main menu, the indent gets stretched too big. What would happen if the stretching slice pixels start higher, keeping the indent same size? Later, no really later tonight, if I have time, I want to try inverting button image. Stone arrow with its shadow, is better than default, but has chunky edge. Submenu, maybe give extra 1 pixel padding around edges. About including a user skin. I worked in QC dept in telecommunications industry for more than 2 years. Criteria is probably similar for any product. Are all known bugs fixed? Does it pass testing and visual inspection. Does it pass all safety etc. Does the customer want it? Including that dark colored Metro mod would be good. Stats show there is demand for it. The High dots per inch in CSM options can run independently. I have to go bye. I never got around to playing with the button images. I did play with the text for the big left main button. In my eyes, it looks smoother. For the other areas, the same/similar button is used, looks ok, without change. but would make it look smoother. Hope you don't mind if I ask for improvements to make it gel. The split main button brightness is opposite position, from reg button. When glass color is on with jumplist menu, the grey area behind shutdown text moved to the right. can at least something be added to give feedback to the user, if they hit the sweet spot? Like having the shutdown text and shutdown arrow, change to dark red, or black, when mouse hovers over area? I like the screenshot where the dividing line for shutdown is further away from shutdown arrow. The download skin not the same. Can you put some changing revision letter or number for each new update download. I think I'm using an older one. Just updated the skin again. Hi! I'm trying to compile a Longhorn pack of all of the builds, including skins, start menus, and taskbar textures, and I know you (Splitwirez) and Juniper7 have been working on some of those skins. Could it be possible to get the taskbar textures for not only the Hillel demos, but the pre-reset demos? (The ones before hillel). Also, how did you guys get the start button as well as the windows start button? Hi! I'm trying to compile a Longhorn pack of all of the builds, including skins, start menus, and taskbar textures, and I know you (Splitwirez) and Juniper7 have been working on some of those skins. Yeah, I made a bunch of really crappy ones a while ago (before I knew what I was doing), but I intend to redo those at higher quality. Could it be possible to get the taskbar textures for not only the Hillel demos, but the pre-reset demos? (The ones before hillel). oh god taht's a lot. Also, 1. I wasn't aware that Hillel was pre-reset. 2. Like, where did you find the start button for Hillel and Plex? Also, turns out there's a different start button for 5219. Gonna try and find that. I wasn't aware that Hillel was pre-reset. Like, where did you find the start button for Hillel and Plex? I ripped the images straight from the leaked builds and reassembled them into working CSM Start Button images. Hey, I'm fairly new here! I downloaded the Longhorn Hillel skin and had one question. 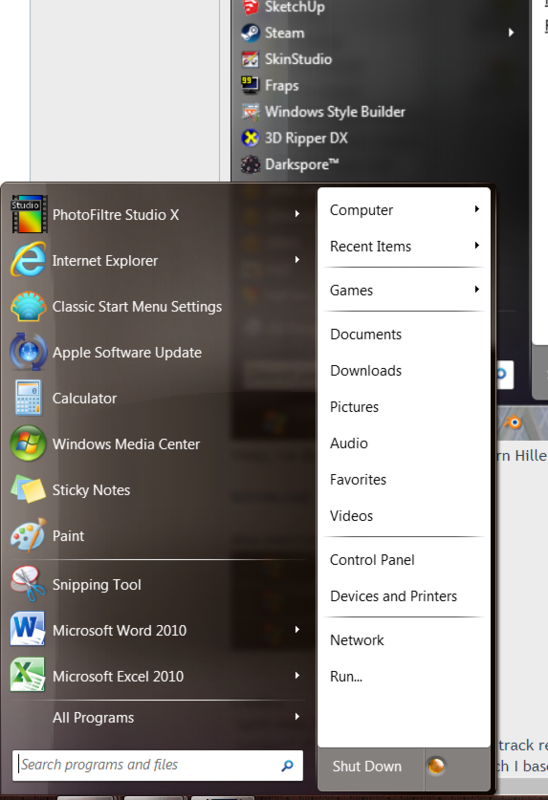 Is there a way to get the User Picture using this skin in the right-hand column of the start menu, as in Windows 7? I'm still using 7 and the only thing about the skin I'm disappointed about is that there's no option to have a user picture up there. Any possibilities to resolve that? Is that okay with you, or is the right column a must? Maybe I'll add both, but if I'm not able to...well...that's why I'm asking. Hey Splitwirez. Well, it seems (if you posted an example image or link) I wasn't able to view it from your reply. So I'm not sure what having the pic in the left-hand column looks like. I am used to the Windows 7 menu which obviously has the pictures at the top right. But the main reason I would like that option is because with the way I've set my menu up, there's just the right amount of space on that side to have it at the top, and I just think it would complete it for me. Like I said I'm just getting into Classic Shell so there's probably a lot I'm not aware of. I mainly got it to change my start button but have been exploring all its features and very happy with it... this is the only thing I feel it's missing. May seem small but with all the features to customize in Classic Shell, I looked everywhere for a way to add that. Any word on the user picture issue? I want to help out a bit. I downloaded your skin and find there are user picture frames in the skin file. All it needs is to copy text from aero skin, so they show up again. In fact, I just did it. I desaturated the frames to match skin. let me know if ok to upload it. Your skin still needs bigger orbs for HiDPI. I would not know where to get them. Nothing stopping you with that extra shadow thing. Do you mean like using the submenu bitmap, only bigger, with a hole for the picture? This upload is just a temp fix. The original frames are still there. I just got back to find this. I'll give it a shot and let you know if I have any questions. That works! The picture actually looks more striking with your skin and the color scheme I use. I like it Thanks Juniper and Splitwirez for taking the time to help.